Finally, the Planet of the Apes and King Kong himself are joining forces in a comic series of their own. In hindsight, it seems like a team-up too brilliant to have never been pulled off before. But just like the other great pairings in the realm of Hollywood legends - De Niro and Pacino, DiCaprio and Damon, Travolta and Cage - this collision is not going to go the way fans will expect. With just two issues down, BOOM! Studios is proving that Kong on the Planet of the Apes is so much more than a case of geek-fueled gimmick. Not that there would even be anything wrong with that, if writer Ryan Ferrier and artist Carlos Magno desired only to pay off the promise of the title. But the most pleasant surprise of the series so far is just how the arrival of a giant gorilla is feeding the original premise and characters of the Apes movie series. The expectation might be to put Kong in the spotlight, but it's the Planet of the Apes crowd who will find the first issues most rewarding. Until Kong comes crashing in on the final page of Issue #2 to change everything they've ever known about Man and Ape history. Time for the entire fandom to catch up. To be clear, it's the original version of the films that Kong is being tied into, not the near future of the modern War for the Planet of the Apes storyline. In fact, this series begins shortly after the first movie, when Cornelius, Zira, Dr. Zaius and General Ursus are still reeling from the chaos that Taylor has caused in Ape City (Charlton Heston's role in the first film). It's Zaius who's looking to erase the epic final moment of the movie, ordering the Apes to destroy the Statue of Liberty completely. But in an unbelievable twist, Ferrier rewrites Apes canon by revealing that if Lady Liberty blew Taylor's mind, it's a good thing he didn't run a hundred yards further. The first issue reveals the massive corpse of a giant gorilla near the Statue of Liberty, kickstarting the series. Cornelius and Zira are suddenly prized scientists once more, as Zaius plans an exploratory mission. Thanks to a scrap of newspaper and an aging map, he's seen this kind of enormous gorilla before: brought in chains to 'New York City'... from a place called Skull Island. And whether the dead female on the beach is an Ape God, a secret piece of Ape history, or a path forward, it's clear she didn't survive on her own. Under the watchful (and always sinister) gaze of General Ursus, the heroes of Ape City and a squad of gorilla soldiers set sail for the other ape fantasy to have captured the world's attention. Fans of either franchise should need no further plot details or praise to pick up the first issues for themselves, and see how Ferrier has tweaked the core mythology already. For starters, King Kong is not a one-off legend, but one of an entire species of giant apes that call Skull Island home. And since that remote location is as removed from the ape-dominated future of Earth as it ever was, the arrival of Cornelius, Zira, and Zaius meets an... unexpected welcoming party. How these Planet of the Apes heroes use Kong to advance, undermine, or manipulate their own prejudices is why fans will keep reading. How Kong will react to seeing fellow apes, human-sized, and intelligent guarantees we have no idea where this story is headed. 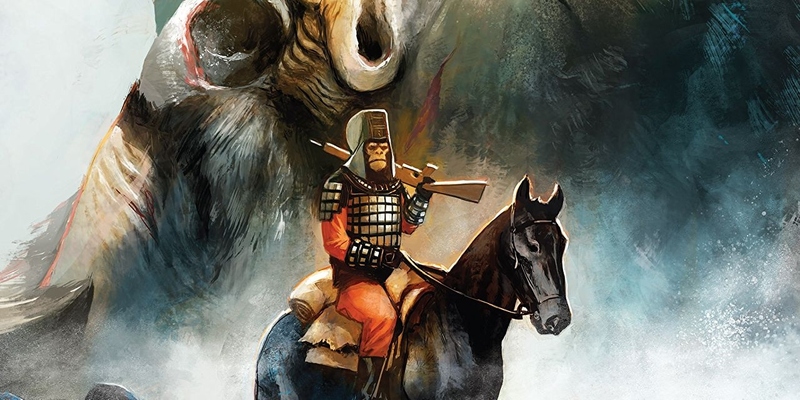 Kong on the Planet of the Apes #2 is available now.